According to the U.S. Bureau of Labor Statistics, the need for licensed dentists is estimated to increase by nearly 18% between 2014 and 2024. But generally speaking, dental procedures aren’t seen as a fun activity. For many patients, root canals are often the most feared. That’s usually because these procedures seem mysterious or because patients worry that they might cause a significant amount of pain. To set your mind at ease, we’ve compiled some FAQs about what you’ll experience when undergoing endodontic therapy with your Panama City dentists. How do I know if I might need this procedure? When the pulp inside a given tooth (also known as the nerve) becomes irrevocably damaged or infected due to decay, several restorations, or other kinds of trauma, you may need to undergo endodontic therapy. Common symptoms are lingering sensitivity to hot or cold, discomfort while chewing or biting down, and severe pain or constant dull aches. Your dentist can also diagnose the need for this procedure through an exam or by X-ray. During this kind of procedure, the pulp will be removed throughout the entire root and canal system. That system will then be cleaned and shaped before being filled with a synthetic root filling and sealed. Patients typically receive a local anesthetic, which numbs the tooth. It’s very rare to feel any kind of sensation during treatment. In the days following the procedure, you may experience sensitivity and discomfort, which can be relieved with over-the-counter or prescription medications. For most patients, what discomfort they experience will go away within 24 to 48 hours. Mild discomfort may remain for several days following the treatment. 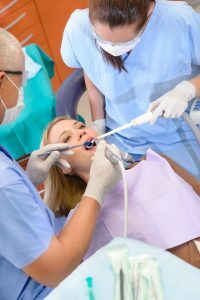 Why should I undergo this procedure instead of having the tooth removed? While cosmetic procedures are largely meant to restore both look and function, a root canal will be nearly impossible for others to see. If you have a tooth removed, this may be an obvious change; even if you get that tooth replaced with a non-natural option, you may still feel a difference. It’s possible that it can also lead to other dental complications or make it more difficult to perform additional treatments. Undergoing this procedure allows you to keep your natural tooth, which is usually the best option. If you’re experiencing increased sensitivity or have sustained a cracked tooth or severe cavity in the past, you may need to explore all options for a root canal Panama City FL has to offer. To find out more about how we can help, contact Dr. Derek Wall today.